Monsoon is declared to be officially over, and trekking season has started. Grey clouds have been replaced by beautiful blue skies and snowcapped mountains are visible most mornings. Now is the time to go trekking in Nepal. We have met with trekkers who have trekked in the Everest area, Annapurna region, Kanchenjunga area and Dolpo and we have been asking about how the different trekking routes are – trekkers tell us that the routes are safe and that they did not encounter any problems trekking. While trekking in high altitude areas of Nepal, one should be familiar with altitude illness, how to prevent and how to treat if it happens. Symptoms of altitude illness can begin to occur at 8000ft (2400m) or lower still, but serious altitude illness is rare below 10,000 ft (3000 m). Symptoms occur due to our body not adapting well to having less oxygen at high altitudes. At 18,000 ft (5500m), there is 1/2 the oxygen available as at sea level and it is 1/3rd on top of Mount Everest. Body tries to adapt to lower amounts of oxygen in the air mainly by increasing the rate and depth of breathing so you breathe faster and deeper. There is also an increase in heart rate. Both of these mechanisms try to bring more oxygen to the body. There is wide individual susceptibility to altitude which seems to be genetically determined. Lack of oxygen causes fluid leakage and accumulation in between cells in the brain and/or the lungs. Symptoms can be mild or severe. Mild symptoms of acute mountain sickness or AMS are headache, loss of appetite, nausea, fatigue, lack of sleep and dizziness. AMS is very common and up to 40% of people trekking in the Everest area will suffer from some form of AMS. Mild AMS symptoms will resolve once someone is acclimatized e.g. by spending one or two extra nights at the same altitude. If symptoms worsen the person should descend to lower altitudes. If unheeded, AMS can progress to High Altitude Cerebral Edema (HACE) causing mental confusion, difficulty with balance and co-ordination. If fluid accumulates in the lungs, this can lead to High Altitude Pulmonary Edema (HAPE). HAPE results in shortness of breath at rest, extreme fatigue, cough – dry in the beginning, and later productive of frothy or blood-tinged sputum. 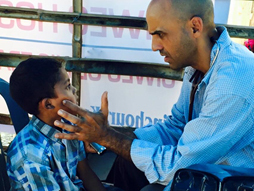 HAPE and HACE are severe symptoms, often co-exist in severe cases and can be rapidly fatal if untreated. Treatment is DESCEND, DESCEND and DESCEND. 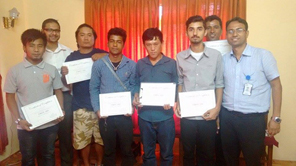 Doctors Sandeep Gupta and Saroj Pokhrel based in CIWEC Pokhara conducted First Aid training sessions for travel and trekking professionals in Pokhara. The participants benefitted from the small group setting that enabled them to get an in-depth understanding of first aid treatment. We aim to continue providing first aid training to professionals engaged in the tourism sector. 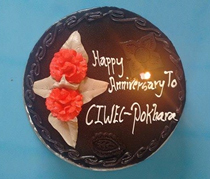 CIWEC Pokhara Completes its 1st year! We celebrated our 1st anniversary with the medical community in Pokhara. We invited medical professionals from different Pokhara hospitals to make them aware about us, our services and to introduce the specialty of Travel Medicine to this distinguished group. We would like to thank all our patrons and friends for the support that you have given us over the past year. CIWEC hospital in Pokhara provides 24 hours emergency and outpatient services, inpatient service, laboratory, radiology including X-ray and Ultrasound, and immunization services including Rabies vaccine and immuno-globulin. 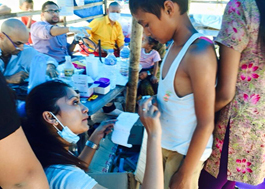 In August and September of this year, we successfully conducted two one-day health camps at Thali, Kathmandu near Sankhu. Doctors Ravi Vadlamudi and Saroj Pokhrel, along with nurses Binita Kunwar, Dawa Kesi Sherpa, Kabita Maharjan and NimaYangji Sherpa took care of about 150 persons each day. This community consisted of persons relocated from Sindhupalchok after the earthquake and had many children with health problems. Post earthquake news: We are not hearing reports of big time health problems at camps where displaced persons are residing. The big one to watch out for would be flu should it hit the camps. We would like to request health authorities to make flu vaccine available to people in camps who are at high risk of flu complications before flu hits this winter. We should be obtaining seasonal flu vaccine at CIWEC sometime in October and we will inform you when it arrives. Thank you.